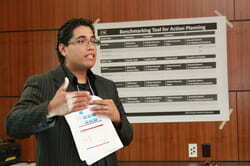 CUE staffer Dominic Alpuche explains how the BESST™ tool works to faculty and staff of Los Angeles Trade Technical College. The Center for Urban Education (CUE) developed the Equity Scorecard™ process to help higher education professionals change practices at their college or university to effectively create equitable outcomes for historically underrepresented student groups. The process is distinguished by five phases, which are explained below. For each phase, different tools are used to assess student performance, identify intervention points and establish goals. At the conclusion of the process, a college or university will have completed a Scorecard that identifies the measures it will use annually to gauge progress towards its long-term equity goals to increase college completion rates for students of color. Faculty and staff from Santa Ana College get a hands-on opportunity to learn how to use the BESST™ and more clearly identify intervention points and set both short-term and long-term equity goals. CUE facilitators collaborate with campus/system leadership to align the Scorecard with existing efforts and identify individuals to serve on the evidence team. The team meets to learn about data and the use of CUE’s tools. Evidence team members use the Vital Signs as a starting point to investigate campus data and increase their knowledge about existing student outcomes. The evidence team uses the Benchmarking Equity and Student Success Tool™ (BESST) to identify and prioritize intervention points. They then identify institutional practices that positively or adversely affect student success through the use of Self-Assessment Inventories. The evidence team sets short-term, actionable objectives and long-term equity goals for priority areas of concern. The evidence team completes the Equity Scorecard™ and with CUE’s support shares its findings and goals with the system/campus. Check out CUE’s STEM Toolkit featuring tools that help colleges and universities reflect on how institutional practices and resources, as well as individual actions and behaviors, affect Latino and Latina success in the STEM fields.